Warm, easy, tasty and most importantly ... cheap! With all of this going on, it's no wonder why pizza is a number one pick for hungry college students. And thankfully, in NYC the streets over-runneth with the gooey good stuff. Around every corner, you are sure to find ten little shops all claiming to have "The City's Best Slices!" Jason Craig (15') enjoys a slice of dollar pizza Photo by Robert Punchur. Description: Perhaps the most popular choice of Kings students, this little shop is simple and to the point. There are no seats, no menus, no complications ... Just pizza. And the pizza is good. Pies are constantly being made and there's always at least one or two people in line, so the food never sits long. This means you are guaranteed a warm (and as the name suggests) fresh slice every time you visit. The idea here is to just get the plain cheese (cheap is boss) but then cover it with free seasonings available on the counter. Slices are large and will definitely fill you up fast. Description: For a pizza parlor with more menu options as well as a dining area, check out Little Italy Pizza. 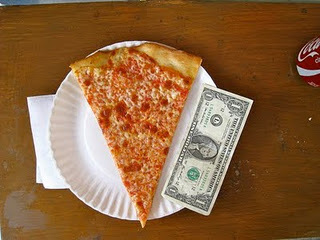 Here, the food may be a little more expensive but slices are large (very large) and toppings are generous. One specialty slice may cost a bit much for pizza, but keep in mind that $3 isn't a bad price for a meal. This well-known shop is the original out of its three locations in Manhattan. While it may not be an everyday stop, do yourself a favor and treat yourself to a specialty slice at least once. Description: It doesn't get much more New York than this! Empire Pizza is an all-Italian staff and restaurant where the main focus is their specialty pies but the menu features over 100 other dish choices. The shop is located just a block away from the Empire State Building and uses the classy NYC flashing lights to draw customers in. There is some substance to the flare, however, as the pizza slices are near-gourmet quality. Pizzas come loaded with toppings, and pieces are so large that there is no way to eat them with just one hand. If you come here, prepare to sit down with a plate because this is not food to be had on the go. Description: If you're looking for a place to escape from the chaos of NYC and enjoy a quiet (and cheap) meal, this is the restaurant for you. Despite a boring name and plain exterior, this little place has good food and a pleasantly laid-back atmosphere once inside. The space is laid out like one long hallway with chairs and tables on either side and the counter in the back. The menu is equal parts Sandwiches and Pizza. Description: Two Bros is THE New York pizza chain. The restaurant is best known for their dollar-a-slice pizza. It comes warm and large with thick crust at any hour of the day. The pizza is always fresh and the line always moves quickly. As far as quick quality eats are concerned, 2 Bros is the ideal of efficiency in NYC.